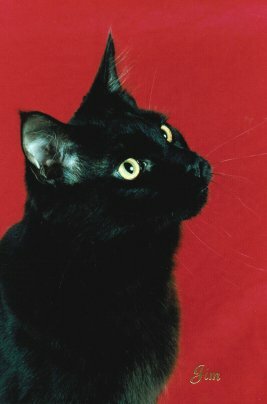 Onyx is a solid black male, son of McCoy and Wills. Heart: Normal and healthy. Screened via Doppler ultrasound at 1, 2, 3, and 4 years of age. Onyx has tested negative for the MyBPC3 HCM DNA mutation. Pedigree: Onyx is out of Wills and McCoy. Click here for a full five-generation pedigree. 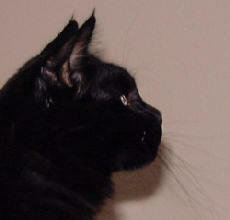 Litters: Onyx managed to sire only one kitten, with Gracie. Onyx is friendly and rowdy and full of fun. He has a laid-back, goodnatured approach to life, and often looks as if he is completely boneless (flop!). He especially likes to drape himself across Betsy's throat while she's trying to sleep -- which, of course, makes it impossible to sleep or breathe, since he is very heavy. Onyx has a wonderful head, with a beautiful clean profile, strong square muzzle and deep square chin. 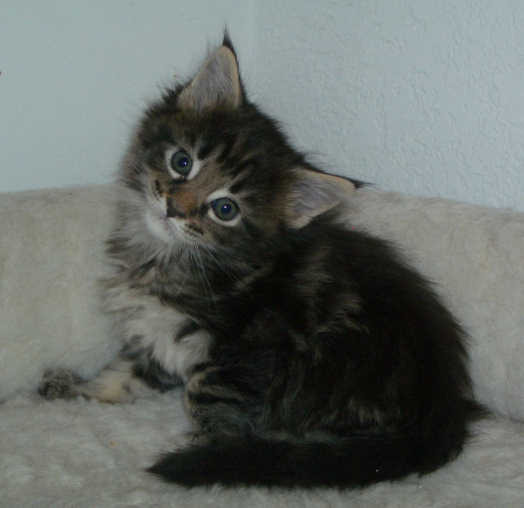 His ears are a little smaller than we'd like, though they are well set, well furnished and have decent lynx tips. Onyx has an extravagantly long body and tail, and at 4 years of age, is just filling out -- for years he was a very large, very lanky "teenager". 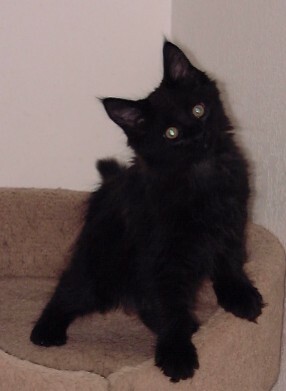 If you want, you can see more baby pictures of Onyx and his littermates.